This much is known: On the morning of February 14, 1929, seven members of the Northside gang, which was at the time led by George "Bugs" Moran (its former leaders, "Hymie" Weiss, "Schemer" Drucci, and Dion O'Banion having already been killed), arrived at the garage of the S.M.C. Cartage Company, a spot the gang often used for deliveries of illegal liquor. Moran himself was planning to join them that morning, but had not arrived yet. When the lookouts across the street saw the men enter the garage, they gave the signal to a group of assassins, who drove two sedans equipped with sirens, intended to give the impression of police cruisers. Two men in police uniforms and two men in trenchcoats alighted from the vehicles and entered the garage, where they apparently used machine guns to fire off over seventy rounds, killing six of the Moran gang members immediately in the bloodiest murder scene in Chicago's history. The dead were Pete Gusenberg, a street-level tough for the Moran gang, John May, a mechanic who worked with the gang, James Clark and Adam Heyer, two ranking members of the gang, Albert Weinshank, a labor racketeer who organized laundry businesses for the gang, and Reinhart Schwimmer, an optician who was associated in various gambling operations with Moran. A seventh man, Frank Gusenberg (Pete's brother), lived for another three hours before expiring in the hospital. After the shooting, the two men in police uniforms marched out of the garage, pointing their guns at the two men in trenchcoats, who held their hands above their heads until they re-entered the cars they arrived in and drove off. That much is known. Who precisely the shooters were, and why they committed the crime probably will never be known. The most common theory is that "Machine Gun" Jack McGurn, one of Capone's lieutenants, conceived the plan as a way to kill Moran, eviscerate the Northside gang's rival liquor operations, and to retaliate against the Gusenberg brothers for a previous attempt on McGurn's life. Under this theory, McGurn hired Harry and Phil Keywell, two members of the Purple Gang, a vicious Detroit-based operation, to rent rooms at 2119 N. Clark St., and to operate as lookouts. When the six men arrived, the Keywells, who knew Moran only from newspaper photos, mistakenly believed Weinshank was Moran, and gave the signal to attack. The photo below shows Clark Street at the time of the Massacre. The short building on the left side of the street marked with an 'X' is the garage where the murders took place; the tall building also marked with an 'X' in the foreground is the building at 2119, the lookout nest. According to the most common theory, the Capone syndicate's two favorite assassins, John Scalisi and Albert Anselmi, who had risen to power in the Genna operation and had previously been involved in the Weiss and O'Banion killings, were among the four assassins, along with Fred Burke, a hired killer from the Egan's Rats gang in St. Louis, and another man, possibly McGurn himself or future Outfit leader Tony" Joe Batters" Accardo, but more likely Joseph Lolordo, who was the brother of the Unione Siciliane president Pasqualino Lolordo, who had recently been assassinated by the Northsiders. Moran, who had overslept that morning, arrived on the scene late, saw the police cars, and fled the scene, avoiding death by a few minutes. Al Capone himself was in Miami at the time, conveniently being questioned by that city's district attorney on gambling-related matters, providing a perfect alibi. McGurn claimed to have been with his girlfriend, Louise Rolfe, in a hotel room at the time. After the police determined he was the mastermind of the murders, they attempted to make Rolfe testify against McGurn in court, but were outwitted when, in a dramatic turn frequently repeated by criminals on Law and Order and CSI, McGurn married Rolfe, allowing her to claim spousal privilege against testifying. Seven years and one day after the Massacre, McGurn was assassinated in a bowling alley, and a sarcastic "Valentine's day card" was pinned to his dead body. Fred Burke was connected to the crime when, several years later, he was arrested for a murder in Michigan. When the police tested two machine guns found in his home, the ballistics matched the bullets found at the St. Valentine's Day Massacre. Burke was sentenced to life in prison for the Michigan murder, but never served time for the Chicago killings. While the above describes the most common theory of the Massacre, there have been endless revisionist histories. Some claim that Capone and McGurn would have been too smart to attract attention to themselves with such a sensational crime, and that the Purple Gang was entirely responsible, retaliating against Moran for failure to pay them for liquor they had imported from Canada to be sold in Chicago. Others claim the hit was Capone syndicate labor racketeering leader Curly Humphrey's idea, and that Moran was not the target at all. Instead, Albert Weinshank, who was standing in Humphrey's way in monopolizing the city's lucrative laundry business, was the intended victim. The "valentine" pinned onto Jack McGurn's body after his killing made a oblique reference to laundry. The true killers and motive will probably never be known with certainty, but at the time, all fingers pointed at Capone, either as the mastermind of the plan, or at least a silent assenter to McGurn's plot. After the sensational killings, Capone's reputation truly became international, attracting constant attention from the press, the police, and worst of all, the IRS. If it wasn't for the St. Valentine's Day Massacre, Capone probably would have continued to fly under the radar for at least a few more years (Capone was, in actuality, a sick man who had only a few years left before senility took hold). Instead, the tax revenue men took aim at Capone's gambling operations and imprisoned him in 1931, ending his career as a gangster. While the S.M.C. Cartage garage, where the killings took place, was razed in the late 1960s, the lookout house at 2119 N. Clark still stands. Over the years, it has remained a rooming house with a restaurant at street level. 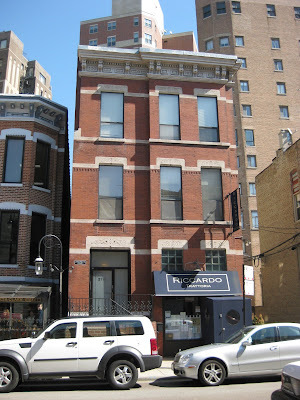 One of Chicago's first sushi restaurants, Samarai Sushi, opened there in the early 1980s, and an Italian restaurant occupies the space today. Burke's guns were discovered in Stevensville, MI in December of 1929 which makes it only 9 months after the Massacre, not several years.